3 Tips For Safely Taking Your Child On A Motorcycle Trip With You - Family Trip Around The World! Travel Blog! If you love traveling with your kids, there might come a time when you consider going on a motorcycle trip together. But just because your kids aren’t old enough to ride their own motorcycle doesn’t mean that you can’t take your trip and have a great time doing so. If you’re smart about it, you can safely go on an extended motorcycle trip with your child in tow. To show you just how this can be done, here are three tips for safely taking your child on a motorcycle trip with you. Anyone’s who’s familiar with motorcycles knows that you always have your passenger sit behind you on the bike, and riding with a kid is no different. According to Jackie Kalyonge, a contributor to Motorcycle-Central.com, not only is having a passenger sitting in front of you illegal, but it also can make it incredibly hard for you to have complete control over the bike, which can put you both in danger of getting into an accident. So while you might think that it’d be easier to keep an eye on your kid if he or she were in front of you, this is definitely not how you want to be going on your motorcycle trip together. Before you put your kid on your motorcycle with you, you want to be sure that he or she has the proper safety equipment to wear, including a well-fitting helmet. According to Emily Green, a contributor to Working Mother, you should only allow your child on your bike if he or she is wearing a full-coverage helmet, meaning that it covers their entire face and is secured on with a chin strap. This helmet should fit snugly on their head in order to best protect them in the event that you get in an accident or he or she somehow falls off the motorcycle. For some kids, it can be hard to take a long road trip on a motorcycle. It’s relatively easy to get bored or fall asleep when riding for an extended period of time, which can make things a little more dangerous for your child. So to help ensure that he or she doesn’t fall off while you’re riding, Art Friedman, a contributor to Motorcycle Cruiser, recommends that you use some type of belt, strap, or harness that will keep your child in their seat without too much effort on their part. 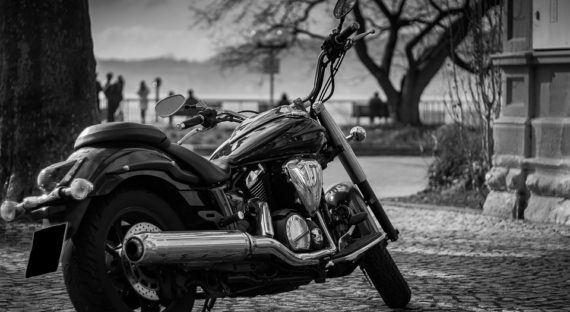 If you’re considering taking your child on a motorcycle trip with you in the future, use the tips mentioned above to help you both be safe on your adventure together.